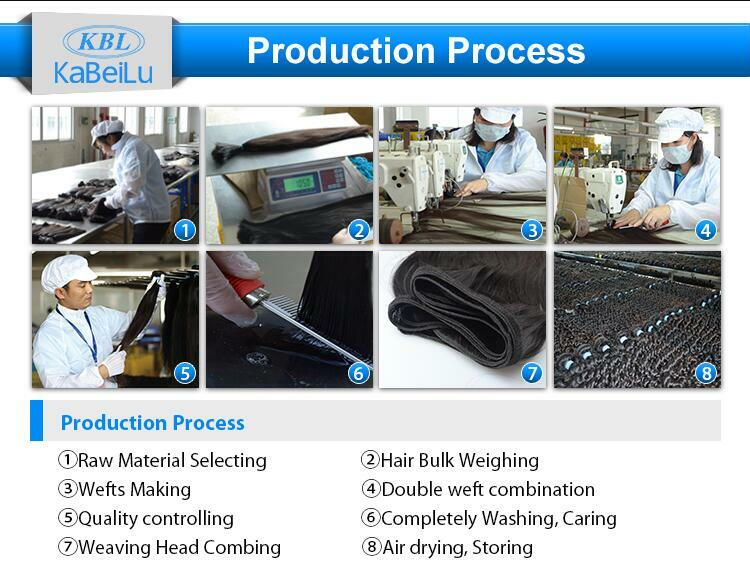 Guangzhou kabeilu Trading Co.Ltd.,Established in 2003.It is a professional hair manufacturer in Shandong,China.Our head office is located in Guangzhou,We are specialized in designing,manufacturing and selling products of the highest quality,such as 100% human hair,hair extensions,hair wefts,human hair wigs,Remy hair,virgin hair,etc.Those products are made from 100% brazilian human hair,Peruvian human hair,we also provide customized products;for example,changing materials,colors and sizes,producing OEM product,etc. Our company have a strong team including,Production Department,Sales Department,Quality Control Department,Service Department,ect. to accomplish the good-quality production to meet Customer's demands. We insist on the spirit of "You satisfaction is our happiness.Until now ,we have been gaining a large market share in the world .especially in USA,Europe,Australia,Africa,South America and Asia,definitely including our native market-China .We believe that good quality with good service is the best way to keep way to keep customers as long-term partners. Welcome to our company and factory.Our showroom display various products that may meet you expectation.Meanwhile,it is convenient to visit our website.Our sales staff number will try their efforts to provide you with the best service,More information,please do not hesitate to contact us by Email,fax or telephone.Herein,we sincerely hope to establish a good and long-term business relationship with your esteemed company through this opportunity,based on equality,mutual benefit and win-in business from now to the future.